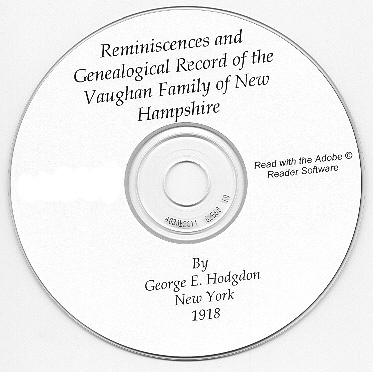 The book, "Reminiscences and Genealogical Record of the Vaughan Family of New Hampshire," by George E. Hodgdon, privately printed in Rochester, New York, 1918 (compiled ca. <1891). 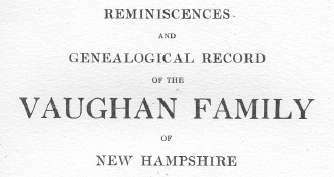 Supplemented by, "An Account of the Vaughans of South Wales, Together With Copies of Official Papers Relating to the Vaughans of New Hampshire, Taken Out of the English Colonial Records in London," by Thomas W. Hancock, 1918. In addition to the book itself you get handwritten notes made by a previous owner in the margins of some pages and on inserted papers that add additional information about the folks in the book. The book has a note in frontispiece that states, "Number 183 of an edition of three hundred copies printed for private distribution only." Please note: This is not a paper book, it is a scan of the original paper book into the digital Adobe PDF format, written on a CD-ROM. You read this book on your computer using the free Adobe Reader software. It is a digital version of a hard to find book. If you could find a copy of the 1918 printed book, it would be very expensive. The 8.0" X 10.5" book has 169 pages including a 17-page fully linked index. 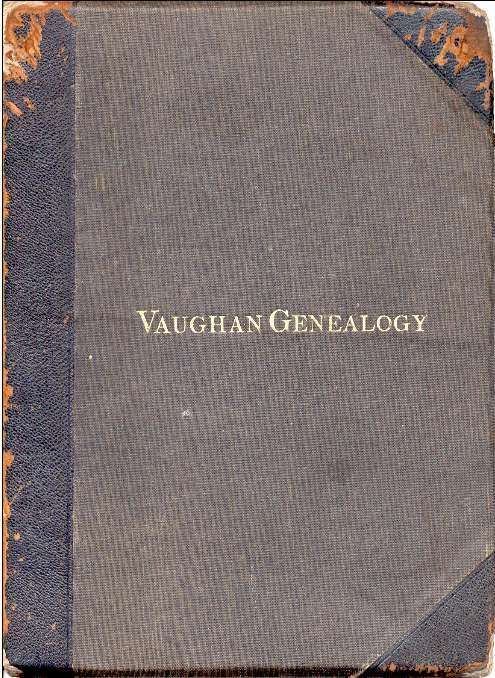 This book is FULL of genealogical information about the Vaughan family and allied families. The book is well used but all pages are clean and readable - there are some annotations from a previous owner on some pages. Please see the list of individuals below. Abigail Vaughan, Alexander Keating Vaughan, Anna Gerrish Vaughan, Ann Greeley Vaughan, Andrew Jackson Vaughan, Beulah Ann Vaughan, Bridget Vaughan, Charles Henry Vaughan, Clarissa Eliot Vaughan, Cutt Vaughan, Edwin Clay Vaughan, Eleanor Vaughan, Eliot Vaughan, Eliot Gerrish Vaughan, Elizabeth Vaughan, Elizabeth Caroline Vaughan, Elizabeth Jordan Vaughan, Elizabeth Keating Vaughan, Francis Edwin Vaughan, Frank Leslie Vaughan, George Vaughan, George Eliot Vaughan, George Elliot Vaughan, Hannah Goodwin Vaughan, Jane Vaughan, Jane Wise Vaughan, Joane Vaughan, John Charles Vaughan, Joseph Vaughan, Joseph Moody Vaughan, Louis Bertram Vaughan, Mabel Vaughan, Mabel Alice Vaughan, Margaret Vaughan, Maria Moody Vaughan, Mary Vaughan, Mary Belcher Vaughan, Mary Jane Vaughan, Maud Vaughan, Olive Plaisted Vaughan, Olivia Storer Vaughan, Richard Cutts Vaughan, Richard Keating Vaughan, Roger Vaughan, Roger Keating Vaughan, Sarah Vaughan, Sarah Eliot Vaughan, Sarah Elizabeth Vaughan, Sarah Rindge Vaughan, Theodore Riley Vaughan, Victor Hall Vaughan, William Vaughan, William Cole Vaughan, & William Tristram Vaughan. 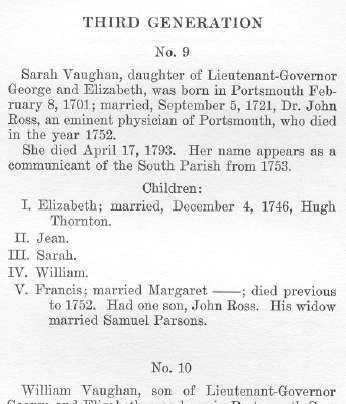 George E. Adams, Abigail Allen, Elizabeth Allen, Jeremiah Allen, John A. Appleton, Theodore Atkinson III, James Bail, Julia Bernice Bain, Eliza Priest Baxter, Andrew Belcher, Anna Belcher, Elizabeth Belcher, Jonathan Belcher, Martha Belcher, Mary Belcher, Sarah Belcher, Sarah Gilbert Belcher, Eliot Vaughan Bennett, Elizabeth Bennett, George Bennett, William Bennett, James Baldwin Bingham, Alexander Vaughan Bingham, Delina Bullard Bixby, Elizabeth Burleigh Bixby, Esther Ela Bixby, Henry Dike Bixby, Sarah Vaughan Bixby, Mary Boxall, Everett Newton Bray, Philip Vaughan Bray, Helen Louise Brown, Mortimer M. Brown, Richard Gilmore Brown, Robert Vaughan Brown, William Bradford Brown, George Bryant, Gardner F. Burnell, John Calef, Elizabeth Campbell, Jane Campbell, John Campbell, Martha Campbell, Mary Campbell, Ann Card, Richard Chadwick, Charles Chambers, Charles Elmer Clapp, Elizabeth Vaughan Clapp, Elmer Ellsworth Clapp, Esther Ela Clapp, John Burleigh Clapp, Richard Elbridge Clapp, Ruth Emerson Clapp, Jonathan Clarke, Mary Coffin, Abigail Cole, Frederick Cole, Jeremiah Cole, William Cole, William J. Cole, Eloisa Monreau Comerais, Jacques Arnault Comerais, John A. Comerais, Chloe Crane, Jonathan Crane, Eulalia Lincoln Curtis, Ann Cutt, Bridget Cutt, Eleanor Cutt, Elizabeth Cutt, Hannah Cutt, John Cutt, Margaret Cutt, Mary Hoel Cutt, Richard Cutt, Robert Cutt, Solomon Cutt, Thomas Daniel, George H. Davis, John Dennett, Captain Donnell, Benjamin Dow, Mary Dow, John Drake, Mary Drake, Abram T. Dudley, Margaret Jane Dudley, Rhoda Dudley, Sarah Duncalf, Elizabeth Dutch, Abigail Eliot, Elizabeth Eliot, Humphrey Eliot, Jane Eliot, Robert Eliot, Sarah Eliot, Theodore Elwell, Arthur Folsom, Mary Folsom, Nathaniel Folsom, Olive Huske Folsom, Sarah Ann Folsom, John Foye, Alice Frost, Samuel Frost, Simon Frost, Nathaniel Fryer, Sarah Fryer, Amanda Bell Gates, Abigail Gerrish, Andrew Gerrish, Anna Gerrish, Benjamin Gerrish, Bridget Gerrish, Charles Gerrish, Eleanor Gerrish, Eliza Gerrish, Elizabeth Gerrish, George Gerrish, Jane Gerrish, John Gerrish, Joseph Gerrish, Judith Gerrish, Mary Gerrish, Moses Gerrish, Nathaniel Gerrish, Paul Gerrish, Richard Gerrish, Robert Eliot Gerrish, Sarah Gerrish, Timothy Gerrish, William Gerrish, Jonathan Gilbert, Sarah Gilbert, Philip Goldthwait, Hannah Goodwin, Ichabod Goodwin, Thomas Grffort, Daniel Granger, Ann V. Greeley, Charles Henry Greeley, Eleazer Greeley, William Greeley, Daniel Greenough, Charles Pullan Haight, Charles Vaughan Haight, Elizabeth Haight, Harriet Bronson Haight, Jared Haight, John Haight, John Belcher Haight, Charles Hall, Emeline Hall, Emeline Cory Hall, Ida Etta Hall, Minnie Hall, Minnie Hedly Hall, Captain Hartley, John S. Heaton, Rebecca Heaton, Silas Heaton, Joanna Hedly, Joanna Potter Headly, William Henry Headly, Charles Hight, Annie Florence Hill, Charles Ela Hill, John Hill, Lizzie Vaughan Hill, Samuel Hills, Ivory Hovey, Daniel Humphries, Olive Huske, Abigail Jordan, Dominicus Jordan, Elizabeth Jordan, Hannah Jordan, Ichabod Jordan, Jane Jordan, Jedediah Jordan, Jeremiah Jordan, John Jordan, Martha Coffin Jordan, Mary Jordan, Mary Ann Jordan, Nathaniel Jordan, Olive Jordan, Rishworth Jordan, R. Tristram Jordan, Robert Jordan, Samuel Jordan, Sarah Jordan, Tristram Jordan, Paul Junkins, Richard Keating, Sally Sayward Barrell Keating, Abigail King, Charles King, Daniel King, George King, James Platus King, Mary King, Thomas King, William King, Ann Kinsman, Daniel Kinsman, Isaac Kinsman, Mary Kinsman, Roger Kinsman, Sarah Kinsman, Susanna Kinsman, Elizabeth Kitson, John Langdon, Mary Langdon, Tobias Langdon, Woodbury Langdon, William Leavett, Mary Leighton, Mary J. Libbey, Mary J. Shannon Libbey, John Lord, Elizabeth Marshall, James T. McKinnin, Lydia Jane McKinnin, Margaret McKinnin, (Unknown) Meiserve, Moses Merrill, Eliza La Motte Moody, Joseph Moody, Maria Moody, Maria Barrill Moody, Joseph Morrill, Josiah Moses, Margaret Moses, Nancy Moses, Sarah Moses, William Moses, Daniel Moulton, Benjamin Nason Jr., Benjamin Nason, Elizabeth Nason, Samuel V. Nason, Mary Nelson, Arthur Noble, James Noble, Esther A. Norris, Lydia Norris, Lydia Parson Norris, Theophilus Norris, Oliver Noyes, Abigail Oberne, Dr. Oberne, Ann Odiorne, Jotham Odiorne, Daniel Oliver, Joanna Oliver, John Oliver, Ann Mary Parker, Charles Colesworth Pinckney Parker, Daniel Humphreys Parker, George Bennett Parker, Hannah Rogers Parker, Horatio Stanley Parker, John Parker Jr., John Pierce Parker, William Parker, William Albert Parker, William Bennett Parker, Samuel Parsons, Mary Partridge, William Partridge, Rebecca Pattifield, Sarah Pavi, James Pecker, John Penhallow, Andrew Pepperell, James Perkins, Daniel Pierce, Lydia Pierce, Ichabod Plaisted, Olive Plaisted, Amanda Plummer, Bredstreet Plummer, Martha Waldron Plummer, Cushing Pratt, Elizabeth Pullan, Jessie Donaldson Pullan, Richard B. Pullan, Josiah Quincey, Sally Rich, Charles Riley, Henry P. Riley, Theodore Riley, Theodore W. Riley, Ann Rindge, Ann Odiorne Rindge, Benjamin Rindge, Daniel Rindge, Elizabeth Rindge, George Rindge, Isaac Rindge, Jane Vaughan Rindge, John Rindge, Jotham Rindge, Mahitable Rindge, Olive Huske Rindge, Sarah Rindge, Thomas Wentworth Rindge, William Rindge, Daniel Rogers, Elizabeth Ross, Francis Ross, Jean Ross, John Ross, Sarah Ross, William Ross, Elizabeth Ruggles, Benjamin Russell, Eleazer Russell, Martha Russell, Henry Rust, Richard Saltonstall, Rachel Savage, Humphrey Scammon, Nathaniel Scammon, Sally Scammon, Jane Sewell, Abigail Shannon, Cutts Shannon, Eleanor Shannon, Elizabeth Shannon, George Walker Shannon, Harriet Shannon, Harriet Byron Shannon, James Noble Shannon, John Langdon Shannon, Margaret Shannon, Martha Ruggles Shannon, Mary Shannon, Mary Ann Shannon, Mary Vaughan Shannon, Nathaniel Shannon, Nathaniel Vaughan Shannon, Richard Cutts Shannon, Thomas Shannon, Sarah Shannon, Sophia Shannon, Thomas Westbrooke Waldron Shannon, William Shannon, Hannah Sheafe, Olive Huske Sheafe, William Sheafe, John Shipway, Dorothea Smith, Thomas Smith, John Sparhawk, Susanna Sparhawk, Elias Stileman, Elizabeth Stileman, Anthony Stoddard, Almira Eliza Storer, Seth Storer, Miss Teal, Benjamin Thatcher, Beulah Thatcher, Hugh Thornton, Hannah Tristram, Ralph Tristram, Abigail Waldron, Ann Waldron, Daniel Waldron, E. Waldron, Edmund Quincey Sheafe Waldron, Eleanor Waldron, Elizabeth Waldron, Margaret Waldron, Nathaniel Sheafe Waldron, Richard Waldron, Samuel Waldron, Thomas Westbrooke Waldron, William Waldron, George Walker, Joseph Walker, Abigail Warner, Daniel Warner, Elizabeth Warner, Samuel Warner, Isaac Watson, Lillias Watson, Mary Wendell, Elizabeth Wentworth, Hunking Wentworth, John Wentworth, Mark Hunking Wentworth, Sarah Wentworth, Joseph Wesson, Elizabeth Westbrook, Mary Westbrook, Thomas Westbrook, Elizabeth Wibird, Richard Wibird, Elizabeth Wingate, Moses Wingate, William Wingate, Nathan Winslow, John Winter, Sarah Winter, Ammi R. Wise, Jane Wise, & (Unknown) Zeigles. 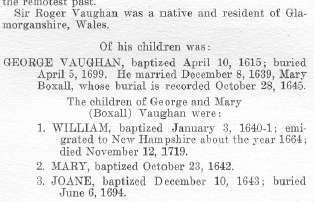 There are quite a few other names in the historical documents sections (Appendix I & Appendix II) that do not contain much genealogical data associated with them that are not listed in this description. 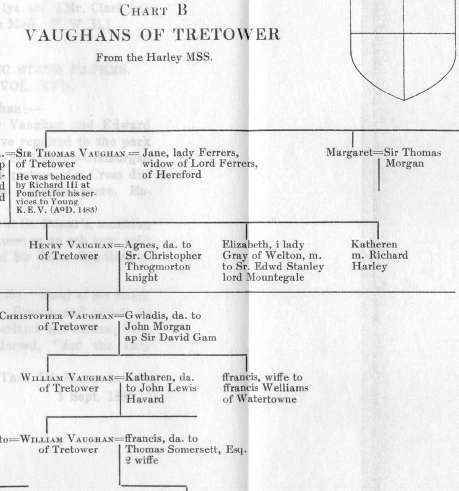 There are three detailed pedigree charts for Vaughan lines and illustrations of Vaughan heraldry with descriptive notes. Note: This is a digital copy of this hard to find book on CD-ROM.